Jazz – in a crisis as well? Just as the rest of the music business – or maybe suffering a bit more then the rest? The retail environment, or better the lack of one, for sure doesn’t help – the few shops left stock mainly top 40 material and less and less niche repertoire with a slower rate of turn around, even so the actual prices of the niche CD’s are higher and therefore would give the retailer a better margin. But it seems to be better to have tons of cheap out-of-copyright material in big box sets on stock then the new Sonny Rollins album.There are only a few specialised shops left either for jazz or classical music, but this consumer wants to buy physical product, as research shows and low download figures confirm. But they can’t find most of the new releases in the few shops remaining in business. And amazon is not the solution either – too much is classified jazz that shouldn’t be there, one needs to know what one wants to buy to find – then indeed amazon works pretty good. Unfortunately there is no place yet on the web who provides knowledge and repertoire for the genre – a jazz web shop that holds all catalogues and books and DVD’s for the genre and gives good and simple advise and offers everything in either physical or digital form – a dream! Audiences are declining in the clubs – unfortunately the economic downturn is showing there as well – the entertainment dollars are the first to be cut if times are difficult and therefore people will think carefully which show they go to and how many they can afford. At least it seems that the summer jazz festivals don’t feel that as yet – some of them have wisely cut down on the number of acts they are presenting, but still got good attendance numbers this year. The mix of jazz and related music genres would have helped there as well to bring the same number of people. Interesting here is that the shops in the summer festivals all did great business – jazz lovers buy CD’s and do so in bigger numbers when they find a shop which carries a good selection of catalogue and new releases – as all shops in the various festivals do. For sure price is an issue in times like these, but not so much in jazz – a good classic recording will be paid for, as there is no alternative, but of course in difficult economic times, the price is key and needs to be looked by the labels case by case. Especially new and exciting young acts could do with a lower ‘introduction’ price until established. On the creative side there is nothing to worry about – the legends and established acts still make great recordings and some new acts will push the barriers further. Europe has a great and very active jazz scene, now independent from the US and Asia is for sure an area to watch out for – great music happening there and as in the classical world, which seems to be dominated by young Asian performers, jazz will most likely go down that road as well – and nothing wrong with that! Jazz in a crisis – only as much as the global music business is as well – but in terms of audiences and creativity the answer is a clear NO! So, I took the A train to Barcelona on Friday, November 25th, to check out the last show of the European tour of Dave Holland with Pepe Habichuela, Josemi Carmona, Juan Carmona and Bandolero. The A in the train here stands for AVE – the fast trains running through Spain and connecting the major cities. Madrid Barcelona is a bit more than 3 hours on the train – 4 stops in-between.Tremendous! Dave was swinging and dancing figures on his bass like an ‘old’ flamenco player – especially in the tune with only the percussionists performing with him. Pepe was in a league on his own that night – his solo piece just incredible (with loud shouts of ‘OLE’ in between from the excited audience), Josemi playing jazzy without leaving the tradition of flamenco and Juan and Bandolero being everywhere and especially where needed rhythmically. And smiles all around and an encore and applause and more smiles and they were deserved, as this was an evening of rare beauty and musicianship. Good that they are talking about looking for new repertoire and to continue the journey together next year with a new album and tour. Thanks! One of the great modern American drummers, percussionists and composers, who till the end of his life has been working and touring with his own groups – the Trio with Bill Frisell and Joe Lovano or the Electric Bebop Band. I had the pleasure of seeing and hearing him with Keith Jarrett (the band featuring Charlie Haden and Dewey Redman) and the Trio with Joe Lovano and Bill Frisell, as well as the Electric Bebop Band, when Wolfgang Muthspiel was one of the guitarists. Always an experience of great music and subtle drumming in support of the soloists. ‘The Reincarnation Of A Love Bird’ would be my favourite record from the Electric Bebop Band, and I really love the one he did with the Muthspiel brothers Wolfgang and Christian plus Gary Peacock: ‘Muthspiel-Peacock-Muthspiel-Motian’. His work with Charlie Haden is very well documented, but especially the Montreal Tapes are recommended here, where the two have been recorded with various pianists – with Paul Bley, Geri Allen or Gonzalo Rubalcaba). There are of course many more great recordings to mention, but I will finish these recommendations with what might be his last release, the ECM record ‘Live at Birdland’ with Lee Konitz, Brad Mehldau and Charlie Haden. And that’s what she is – a singer and a unique one. Not a jazz singer per se and therefore all the comparisons with Billie Holiday are wrong, just a singer, who plays with the melody of the song, phrases these melody lines differently every time she performs a tune, as if she wanted to re-invent the song newly in every show – and to a point she does – sometimes even changing the lyrics to put in experiences or feelings of the day or moment. The concert in Madrid at the Teatro Circo Price on November 18th was no exception and it was probably the best I have seen – and I have seen a few! The show was simple, but well built musically and had at the end the audience clapping and singing with her !! Even the all black clothing of the musicians and Madeleine (with the exception of some flowery embroidery on her coat) made sense, as this is a beautiful but dark affair, with moments of sunshine of rare quality. I think she has now the band she needs to be comfortable on stage, good and solid musicians which weave a carpet of music for her to walk on, to play with the melodies and do whatever comes to mind – the guys are there to support and guide her back if she strays to far. And amazingly all that happens with her seemingly being in control. The show was a selection of her most famous tracks and a few songs from the new album ‘standing on the rooftop’, from which especially the upbeat ‘Don’t pick a fight with a poet’ and a slow and haunting version of ‘Love in Vain’ stood out. She for sure makes you think – with her little comments in between songs and of course with her song choice and the lyrics of these. The audience went all the way with her and was rewarded with a great concert. Who can ask for more? “I came here to enjoy the evening – so I hope you will as well. Don’t think too much – don’t spoil it, just enjoy!” And we did! There are few singers like Lizz Wright – a beautiful and powerful voice, with incredible control and immediately recognizable. A sophisticated song selection or compositions of her own, which are story telling at its best. She gave with her tight and sensitively supporting band (acoustic and electric guitar, bass and drums) an overview of her 4 records, a mix of ballads and up-tempo songs, which she both handled majestically. A new addition to her songbook is the heart-warming Etta James song ‘A Lover Is For Ever’, which she performed with so much power and emotion, that tears were rolling on the faces of parts of the audience – and isn’t that what we want from a great performance, to be emotionally touched? Equally deep was her rendition of the title song of her last album, ‘I remember, I believe’, as well the final encore, a simple arrangement for guitar and voice of ‘Amazing Grace’! From what she told me after the show, I understand that she is discussing with Raul Midon to tour next summer in Europe together – what a TREAT would that be !! Two such strong and beautiful voices together – for sure worth waiting for! ‘The Traveller’ (the title of her latest album) stopped in Madrid’s Teatro Circo Price two nights ago and performed for the first time in an almost full venue this new program in the city. 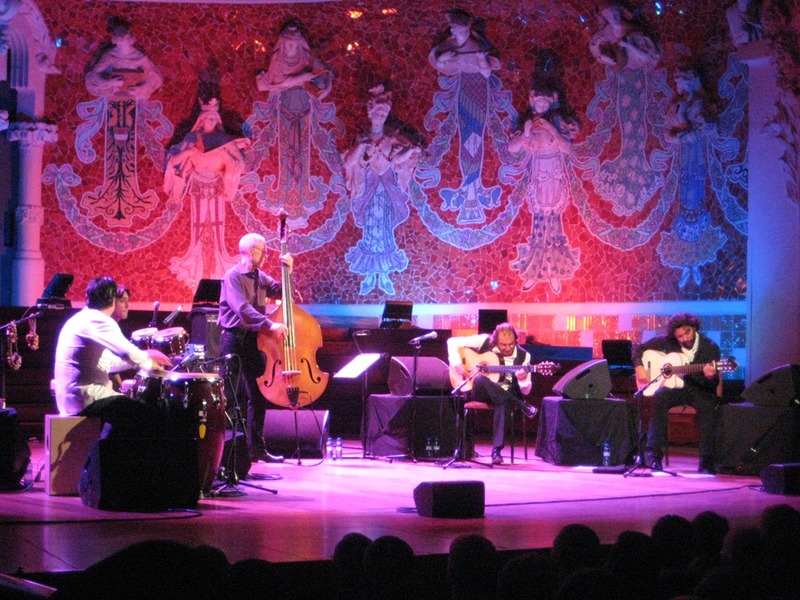 Produced by Javier Limon, the album is a voyage from India to Spain, following musically the Gypsies trail through Europe and creating a unique mixture of Indian and European music with a shot of Flamenco on top. In the performance Anoushka had beside her own group a flamenco guitar, Spanish percussion and a flamenco singer – Sandra Carrasco, one of the new singers in Spain who are starting to built a career and as well a protégé of Javier Limon. Personally I think this is one of the most exciting meetings of East and West since Shakti, as it combines the true elements of both into one unique sound and expression. As the record, so the live show – beautiful and emotional and technically absolutely amazing what Anoushka does on her instrument. ‘The Traveller’ will be on the road for quite a while still – UK, Germany, Greece, Luxembourg, Switzerland and Portugal and next year India and the USA. Definitely worth checking out! It is a pleasure and privilege to attend all these amazing concerts. I will gladly continue to write about the good things I hear and see, as sharing these seems to me more important than writing about something I didn’t like. As all of these experiences are individual and expressions of my taste and musical understanding, it is better to write about positive experiences than negative ones, even so there is no guarantee that everyone else would feel the same as I do in the same concert – or listening to the same record. Roy Assaf, Ronen Itzik, Jorge Roeder –‘augmented reality’. A piano trio that is performing mainly Roy Assaf’s beautiful and interesting compositions plus a track by Richie Beirach (Leaving) and Benny Carter (Only trust your heart) and an absolute gorgeous version of Alfonsina y El Mar by Ariel Ramirez. Fresh and exciting – worth to look for it and listen. Who has heard the album ‘Hands knows how special this project and how great the music is. Now almost 3 years after the album was done and 4 years after Dave and Pepe first met, they are on a tour through Europe again and are better than ever ! The show has changed slightly over this period of time and they are trying new songs as well as new settings, like Dave just with Bandolero and Juan Carmona, the two percussionists of the group, or a trio of Josemi with Juan on second guitar and Bandolero on percussion – an amazing duo of Dave and Pepe and of course all 5 together, playing like a tight group with lots of improvising and smiles all around. They all have fun and seemed to utterly enjoy the evening – and an almost full Auditorium Nacional rightly didn’t let them go without an encore and a standing ovation. What is so incredible about this adventure for Dave , is that he is actually playing flamenco and not jazz – he is the beat and the heart of this band, but his playing is different and on the song he did with just the two percussionists he almost sounded like a flamenco guitar player. He gave his Thanks to his teacher Pepe with this song – it couldn’t have been better! Josemi Carmona, Pepe’s son, did shine especially in the two compositions of Dave they performed on the night, as well as on his on track ‘Tangroove’, taken from his recently released album ‘las pequenas cositas’. Dave and Pepe and the rest of the group will tour for another two weeks before ending the European show with a concert and a party in Barcelona on November 25th and will then start looking for more repertoire and making the second album. If you ask me – the sooner, the better! !